Here you will find top products at reasonable prices! 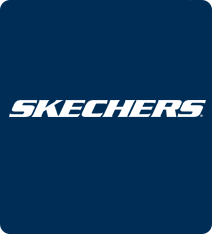 Women, men and kids conscious of the current trends will get their money's worth with the California-based Lifestyle-brand SKECHERS. The sporty, comfortable and top-trendy products are available in various colours and sole types. Therefore, SKECHERS footwear reflects the perfect balance between sportiness, coolness and class! We will answer all inquiries as quickly as possible, generally within 24 hours on business days.